People of the blog, this is of utmost importance! You know how Margiela is having this lovely collaboration with H&M launched just in time for my birthday? Yeah, you probably didn’t know it was a big present for me, but that’s not the news though. 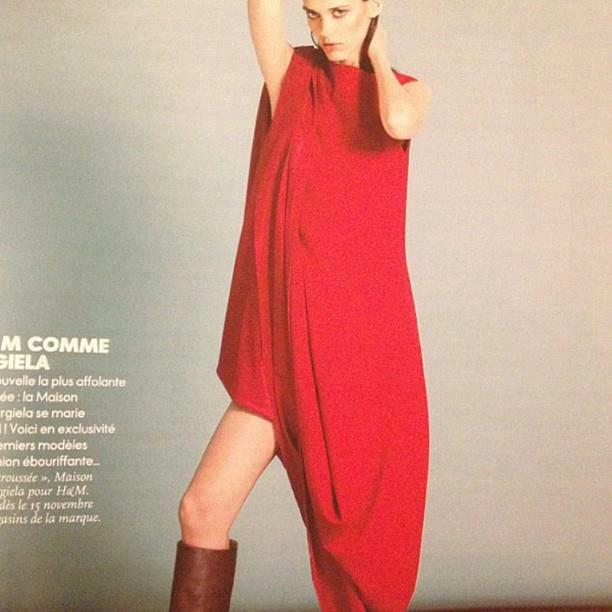 The news is this: it’s been splashed all over the french Elle and you get to see it right here! Above, it’s above…! I think red is one amazing color right now, trending like hot temperatures in mid-July, so if there’s one red piece you get for fall, make it this gorgeous dress. I wouldn’t throw away the men coats (seen sketched in the videos) which I hope come in tiny baby men size so I can wear them myself. I know how this usually goes: you see the collection for months on end being advertised by everyone and their mothers and eventually grow somewhat tired of making mental shopping lists that you end up adding and subtracting more times than any normal person should. By the time the collection hits the stores, you’re overexposed, because in your mind you’ve already see, bought and wore the items. I don’t think this will happen with this collaboration and if it ever does, I’ll try to remember this feeling right now. It’s screaming loudly in my ears WANT WANT WANT.